I knew my body wouldn’t let me go full term with my second baby, Connor was premature and once I got over 31 weeks this time round I was pretty much prepared for any day. I blame luke slightly for triggering this delivery😂. The Sunday 22nd July before I gave birth we decided to do a carboot to declutter a bit before baby arrives, once we’d finished we decided to go out to burley for lunch and once we’d eaten I knew I didn’t feel quite right. I was so tight around my tummy all day and Braxton Hicks were ALL the time! But Luke made me walk round burley going in all these pointless shops and I’m almost sure that’s what triggered our week ahead! Sunday evening we were down the hospital convinced he would be here that night, I was 34weeks and contractions were coming thick and fast every 2 minutes and pain was moderate. They did a few tests and told me he wouldn’t be here within the next 14 days so go home! We were shocked but what can you do, so off we went- I struggled for 3 days having contractions on and off day and night, I was told to be on bed rest etc which is easier said than done when you have Connors last week at school, Millie’s dance show and a possible first football match for Connor all in the same week! Not to mention the clients I had to cancel as I couldn’t really move! Thank the lord we made it to Wednesday evening with no baby so off we went to Millie’s show which she did brilliantly. I’m so glad I made myself go as I’d of been gutted to have missed it, she was in more dances this year and you could really seen how much her confidence has come on since the last show she did! By Thursday I was actually more comfortable than I had been all week, I’d taken Connor to the shops for an ice cream and to get out the house for a little bit, I’d done all the housework and washing and even though I was knackered I felt alright. We had a really chilled night that evening, all of us led in bed watching the telly, once Connor had gone to bed I had a lovely hot bath as my back was starting to hurt a little. After that all hell broke loose, I was bleeding heavily, pain was high enough to cry and I called mum probably barking at her down the phone now I think about it! It was about 10pm at this point and when mum walked through the door she told us to stay on the phone to labour line but get in the car to hospital regardless! The 15 minute journey to the hospital was the longest, stopped at every sodden traffic light and I genuinely though I may have the baby in the car park once we got there. From there on it all progressed really quickly. When we first got in there I was examined and already at 5cm dilated- excellent the first thing I shouted for was an epidural! I was not interested in all this no pain relief malarkey, but 20 minutes in and the midwife said those dreaded words….. THERES NO TIME. I was at 9cm and could feel every ounce of my body wanting to push but he wasn’t quite ready not to mention my waters hadn’t broke! The midwife we had was again amazing! They really do have patients of saints and they’re so calming. Mum had arrived and from what I can remember sounded like she was begging them to break my waters so he’d be here! Once they finally agreed it all went down hill from there. Unfortunately due to them helping me along slightly by doing that, the baby managed to loose the birth canal and my cervix swelled meaning I went from ready to push to 6cm dilated!!! The upside was by this point they allowed me an epidural and once it had kicked in after 40 odd minutes I was more comfortable, more relaxed and didn’t have “scared eyes” anymore according to my mum and midwife! By about 4.30am it was decided I would have an emergency c-section which honestly terrified me! Prepping for surgery like that is horrendous, all those people in the room, I was so numb I couldn’t talk or move my head much, I couldn’t hold Luke’s hand because I couldn’t move them even though he had hold of me- it makes me a bit emotional writing about it because While all this was going on around me, all that I kept thinking was if something happens I won’t see the baby, if I stop breathing I’ll die, I could feel myself wanting to be sick but had no muscles to be sick so I could just feel it sat there and I thought I’d choke. It’s funny isn’t it when something like this happens what goes through your brain, I just led there thinking I’d not kissed Connor because he was already asleep when we left for the hospital, I saw my mum choked up as we left for theatre and thought about how she’s sat on her own waiting while her daughter has a major surgery- I was trying to think about how I’d hold the baby as I was so numb I couldn’t even grasp hold of Luke let alone a newborn! I think having an unplanned caesarean is worse because you don’t have any time to process what’s about to happen, you have a million and one people rushing round you, in my case I’d been through all that pain and preparing to deliver naturally to then be told to prepare for something equally as traumatic. I think if I’d have known I was heading for a caesarean a week or so before labour it would have probably been a better experience for me. My midwife was present through it all and when she came and said goodbye to me in recovery she told me she’d never forget my scared eyes- and I think it was such a scary experience because there was just no preparation for it all. 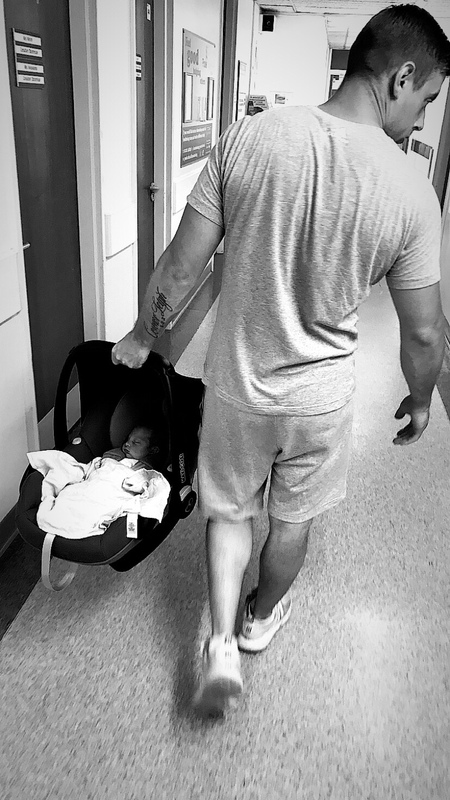 ✨ Roman Luke ✨ was born on Friday the 27th July at 5.41am weighing a healthy 7lb2oz and when they pulled him out and we heard his cry it was literally the happiest time ever. And even better that I survived it all HA! Now I’m looking back on it and have had a month post surgery to reflect I’ve come to the conclusion that I’m just not going to have easy labours. I have really good pregnancies but both my children now have been premature and had dramatic starts in life and it’s like my body just refuses to play ball with labouring a child. I’m very very lucky don’t get me wrong, both my kids are healthy and happy and even though Connor was too tiny to cope on his own for the first 6 weeks of his life and roman was born with air trapped around his lungs resulting in another stay on the neonatal intensive care unit they both came out the other side so I know I’m very lucky. Recovering from a c-section hasn’t actually been that bad, the first week was like an 18 wheeler truck had hit me but after the first couple of days I was up and walking around trying to get myself moving again. Now Roman is almost 5 weeks old and I feel really well in myself. Sometimes at the end of a day I know if I’ve done too much as I ache but apart from that I’m all good. It’s hard because you forget your body is healing 2-3 layers inside it’s not just the cut on the outside, so my health visitor and midwife have told me off for doing to much in recent visits but I’m almost over the 6 weeks healing period! Let me tell you I cannot wait to start exercising again! I’ve got half a stone left to get off until I’m back to my pre pregnancy weight but I’m really wanting to tone and tighten my tummy so this time next week when I have my post natal check with my doctor that’ll be the first question I ask! Being home with a new baby has been strange again, Im so used to Connor being independent and sorting himself out which has actually been a blessing as I’ve now got a tiny human that totally relies on me again! I’m really enjoying doing it all again though, with Connor I was young and knew nothing, this time round I’m older, and I’ve done it all before so there’s not really any surprises! We’re so lucky that our children are obsessed with their new baby brother. Millie just sits and strokes him all day, she wants to hold him while I make bottles, and asks me questions about everything I’m doing for him, and Connor is just so proud he wants everyone to know Roman is HIS little brother. I’ve listened to Connor say “it’s ok darling” “mummy’s coming darling” and “hello darling” so many times and it never gets old, melts me. It’s been an absolute rollercoaster from the minute it kicked off on that Thursday night but I wouldn’t change any of it, and I can’t wait to see what’s in store for us as a family of 5 and a mum of boys! I’ve warned Luke that me and Millie need extra special treatment now we’re officially outnumbered!! Look out for my milestone posts with baby roman and what we get up too!! Previous What’s In My Baby/Hospital Bag? Next Roman’s 3 months old! I’ve got goosebumps reading this. such a lovely post.